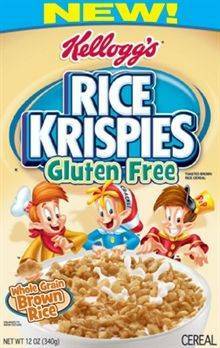 Living Gluten Free in St. John's, Newfoundland: Gluten Free Rice Krispies! Gluten Free Rice Krispies are here! Yippee!!! They taste just like the regular "non gluten free" version (at least from what I can remember). They snap, crackle and pop and have a nice crunch! I had mine with honey and some cransins and it was an excellent snack! What's even better is that like regular mainstream cereals, the gluten free version is fortified which is a rarity among the gluten free cereal world! I found mine at the Sobeys on Merrymeeting Road, but they might be available at other Sobeys stores as well. The price was just under $5 which is consistent with the non-gluten free variety.